What glue can be used on a laptop without damaging the screen? I recently dropped my laptop(HP Envy 6t) and now the plastic bezel around/covering the screen has cracked at the bottom right hand corner next to the hinge and come away from the screen. 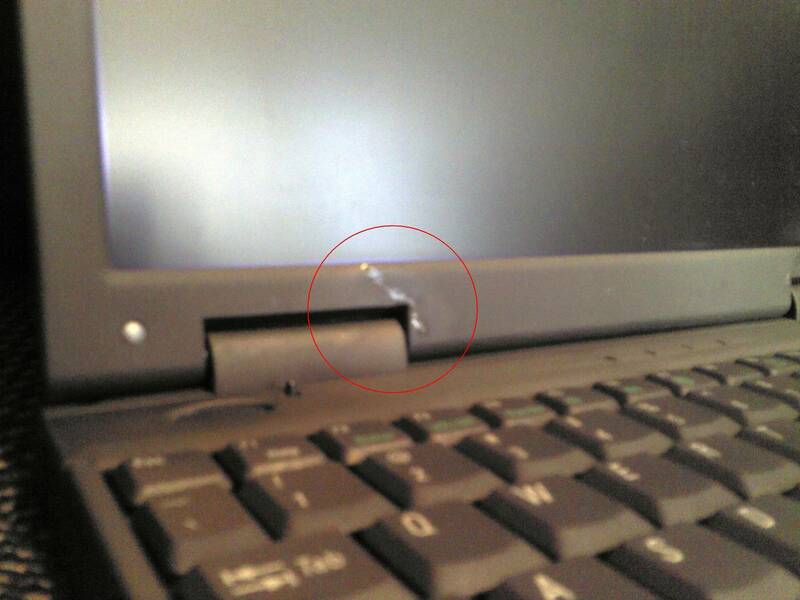 The LCD still works fine, but every time i open and close the laptop, it cracks loudly and threatens to break more. Does anyone know how i could fix this? Is there any strong, fast setting glue that i can use that isn’t very bulky, and won’t damage the laptop in any way? superglue doesn’t work because it is too thick so that if i put it in the gap between the LCD and the bezel then they wouldn’t go together properly again. Any ideas would be appreciated. I have no warranty, and so can’t claim on that. I wouldn't use any liquid glue on the laptop. Have you looked on ebay for a replacement bezel? I'm sorry about your computer troubles. I think the likelihood of successfully repairing your device is relatively low, given that cracks near the hinge can sometimes bear a great deal of stress from opening and closing and lid of the notebook. I have a laptop where the bezel cracked in multiple places. You can see where it was repaired using an epoxy glue. However, this particular crack was not in a location that bore a great deal of mechanical pressure. Glues that are under a lot of physical stress will quickly break down. That E6000 glue looks, actually, a lot better than the epoxy glue for plastic that I was going to suggest. But in all honesty, if it's near a joint, and has any kind of pressure or force exerted on it, to my knowledge, no glue is going to hold it in place. I think just leave it there.all liquids might damage the laptop,and superglue if dripped onto the screen will leave a nasty mark that is almost impossible to remove without damaging the screen.or get a replacement bezel. Tried SuperGlue but didn't help in the long term. Had to use Araldite and some aluminum foil. Was quite firm. J-B Weld works great too. But don't use it as heat sink paste. Just sayin'. Never did it. Personally, I would recommend against traditional super glue. My preference is E-6000. I used it to repaid the metal hinges in my CR-48 Chromebook and it worked like a charm. It works well not only on plastic, but also metal to metal. My hinges are not like new, but very close. Good luck! Superglue (cyanoacrylate) is thin like water. Put it in crack and pinch together bezel for 10 sec. The drop may have also broken an internal plastic clip holding bezel against sceen. Try double-sided tape (cellophane tape with adhesive on both sides) available from office supply store to stick bezel to screen.